Electric kettles are simply awesome! Who could argue with a device that boils your water in a matter of seconds? It’s simply a modern appliance that every kitchen needs. But things get complicated if you live in a hard water area. Buy the wrong kettle and you’ll nauseatingly say goodbye to your hard earned money. That Limescale is just nasty! But today, we have a solution. The market is filled with kettles that combat the damages of unwanted limescale and sediments. So let’s take a look at the market’s best kettles for hard water! 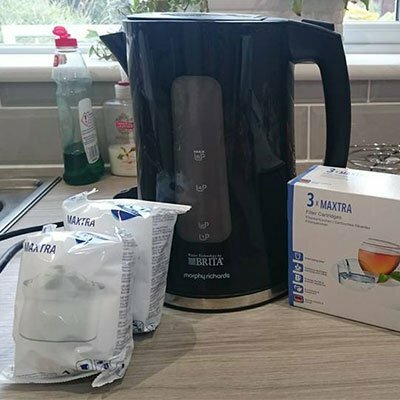 3 Which Kettle is Best for Hard Water? 4 How Do You Find the Best Kettle for Hard Water? Hard water is when you’ll find copious amounts of sediments in your water. Most of the time, these are deposits of calcium, magnesium, metal, lime scale, etc. As such, they make washing your appliances difficult. In most cases, it’ll even destroy your kettles and such. And more importantly, it’s not healthy to drink. So you’ll want a kettle that filters out these sediments from your water. Of all the electric kettles we tested, these ones stood out the most for combatting hard water. So read along with us to find the best electric kettle for you! Morphy Richards offers a large electric kettle that’s pretty soft on your wallet. But does a budget price come with budget performance? Let’s find out. At 1.5 litres, this electric kettle harbours a much larger capacity than its competition. As a whole, you’ll be able to pour about 6 cups without the filter. But even with the filter, you’ll still get a full 4 cups of boiling water—which is fantastic! One interesting design choice here is that this Morphy Richards kettle measures your water by cups, not litres. It’s not a deal breaker or anything. After all, how often do you really need to know exact litres from your kettle? For most of us, it’s not often. But it’s still an interesting design quirk. This kettle makes use of a 3kW concealed plate. So it’s only about a minute wait for the water to boil. You’ll even get a blue LED light to let you know when the water is boiling. Needless to say, it looks pretty cool during the process. Unfortunately, the window to view the water is quite small. So it’s hard to spot any floating particles or if the water’s boiled enough for your needs. 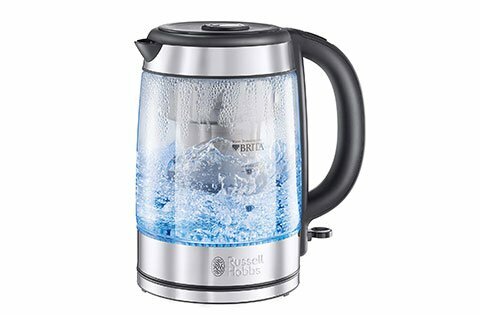 Much like other kettles, you’ll get a Brita filter that does a fantastic job of removing sediments from your tap water. For us, it only took about 15 seconds or so to filter the water. So there’s not much of a wait here. For an added bonus, the Brita Memo even reminds you when you need to change filter cartridges. Brita recommends monthly changes here. But we found once every two months with Brita Maxtra + filters works perfectly fine. Overall, the build is where you’ll start to feel the budget price. Everything here feels plasticky. Even the power button seems like it could chip off at any given moment. Also, note that the lid pops off if it’s not attached correctly. So be careful of any splashes. This Morphy Richards kettle comes with a 2-year warranty. Hard to see water inside. Lid pops off when not correctly attached. At the end of the day, the Morphy Richards 120009 does its job quite well. It filters and boils your water quickly. What more could you ask of an electric kettle? It’ll even hold more amounts of water at once compared to its competition. Just be aware of its cheap build. Feeling sick of plastic kettles? then this Russell Hobbs appliance has you covered with a glass build. But how does this compare to other electric kettles on the market? Read along to see for yourself. At a quick glance, you’ll get 1.5 litres of kettle here. But you can only fill 1 litre with water. So you’re looking at about 2 full cups here with the filter in place. Thankfully, you’ll get marks along the way to see where the max capacity lies. Unfortunately, getting the water to that point is a total pain! The open area to fill with water is quite small. So it’s pretty time consuming to actually get the fill just right. And to take even more of your time, you’ll need to filter the water a whopping 3 times before the kettle reaches max point. Also, don’t accidentally fill above max capacity. Otherwise, you’ll mix your filtered and non-filtered water. So, you’ll be forced to restart the process all over again! And trust us, you’ll see all those disgusting particles floating around! It’s a complete headache when this happens! So be super careful here. You’ll get a 3kW plate here, so it’s about a minute wait to get your boiling water. It’s pretty on par for electric kettles. You’ll also get those blue LED lights when the water boils. So it’s a pretty cool aesthetic as well! The kettle also happens to be made of glass and offers complete visibility. So it’s ultra-easy to see if any particles slipped through the filter. As usual, you’ll get the trusty and reliable Brita filters here. And as you’d guess, they do a great job of removing limescale and other sediments from your water. You’ll also get a reminder system for when you need to replace your cartridges—which is about a monthly basis. Overall, Russell Hobbs did a fantastic job of creating sturdy kettle here. You’ll get a durable Schott glass frame with this electric kettle. And aside from the power button, nothing really feels cheap or plasticky here. It’s definitely some quality design here. Unfortunately, note that the filter is made of plastic. So every now and then, some plastic particles can slip into your water. As far as weight goes, this kettle weighs in at 1.43 kg. Therefore, it’s on the heavier side. But on the bright side of things here, the kettle sits on a 360 base, allowing right and left-handed people to use it comfortably. One final note. If plastic is not an issue for you, you can opt for a more affordable plastic model to save a bit of money. All in all, this Russell Hobbs kettle more than gets the job done for boiling and filtering your water. Its glass design helps it stand out amongst its competition with ease. As long as a small filling reservoir isn’t an issue for you, this is an exceptional kettle for any hard water area! 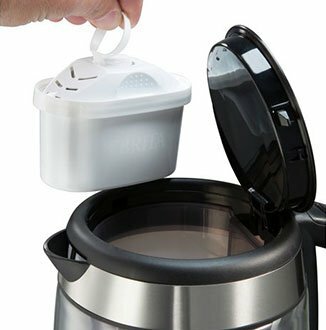 Are you looking for one of the most uniquely designed electric kettles out there? Then you can’t go wrong with this Breville appliance! Its frame is like no other kettle on the market. And it still boils and filters your water quite well. But how does it stack up against the other kettles? We’ve got the answer right here. Overall, this kettle offers you a single litre of capacity. So you’ll get about 2-3 cups of boiling water with the filter attached. Compared to other kettles, this is pretty average. Also, filling is easy with the large reservoir. Plus, the marks on the side are clearly visible, so you know just how much water your pouring in! Where things aren’t so great is when it comes to actually filling the kettle. The tank above the filter is super small. So you’ll need to fill this area twice in order to fill your whole kettle. What’s worse is that the water pours through the filter at a painfully slow rate. In fact, it takes more time for water to flow beyond the filter than actually turning the kettle on. As with the other kettles, you’re getting a 3kW plate here. We found the water reached a full boil in about a minute. Plus, the LED lights do a great job of indicating when the water is boiling. Speaking of boiling, this kettle mutes the sounds of water splashing quite nicely. Plus, the electronics themselves make hardly any noise at all. So if you’re looking for a quiet kettle, this is one of the best you’ll find. 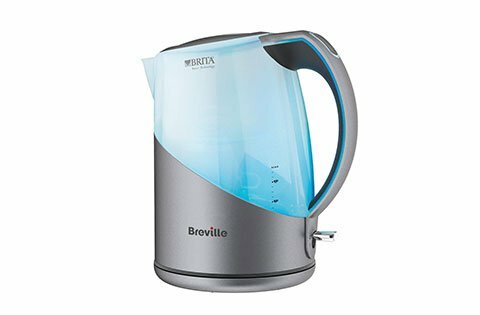 Breville includes a Brita filter with its kettle. As with the others on our list, you’ll get Brita memo reminders when your cartridges need to be replaced. By default, Breville includes the Brita Maxtra Cartridges here. But we found the cheaper off-brand cartridges do the job just as well. So you can definitely save some money here. Despite its looks, this kettle is all plastic. Yes, even that grey plate is plastic, not stainless steel. However, cosmetically, it’s a downright sleek design! Also, despite its cheap feel, we never experienced any parts breaking during our tests. So it’s not ultra-fragile or anything of that sort. Simply express some caution when using it. What’s especially nice about the design here is that the kettle comes with a push-button lid. So you’ll get a bit more control when pouring your boiling water. Also, this kettle weighs a solid 1.36kg. It’s on the heavier side of the spectrum when full, but it’s not unbearable by any means. Area above the filter is small. The Breville VKJ 972 does a great job of filtering and boiling your water. Even better, it does so quietly! So if you can get past the cheap and plasticky feel of this kettle, it’ll do a stellar job of making you some great cuppa. 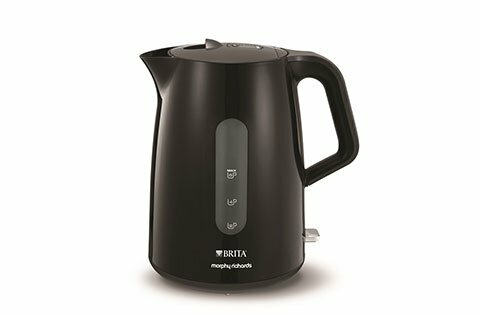 Which Kettle is Best for Hard Water? In truth, you could make a case for buying any of these three kettles. So really, this will all come down to your needs and budget. 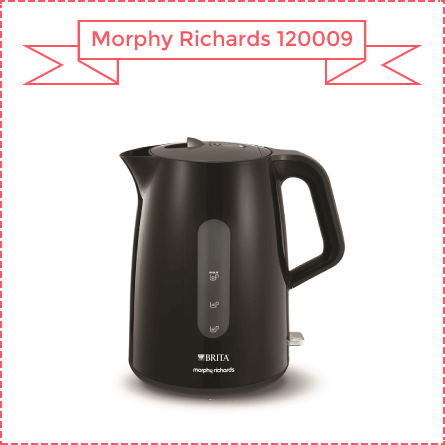 If you’re looking for something affordable with a high capacity, you can’t go wrong with the Morphy Richards 120009. The only real downside here is that the kettle is made almost entirely of plastic. Don’t like plastic? 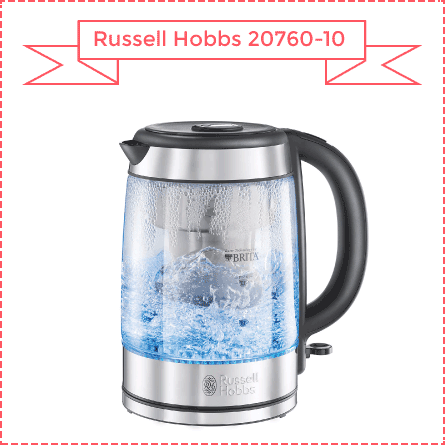 Then the Russell Hobbs 201760-10 is the kettle for you! The glass build helps it stand out from the rest. Just be aware that it takes longer than average to fill this kettle full. Also, the filter is made of plastic, so it’s not entirely plastic-free. And if you’re all about cool design, then be sure to give the Breville VKJ 972 a closer look. But make a special note about the all-plastic design, low capacity, and epically slow filling speed. How Do You Find the Best Kettle for Hard Water? Ever wonder how to find the best kettles in hard water areas? In short, there’s no simple answer here. But to help you out, here’s a quick guide of some specs and features that separate the stellar electric kettles from the ugly. This is one of the reasons you’re buying an electric kettle, right? After all, who has the time to wait 7 minutes for a stovetop to boil your water? Very few of us! 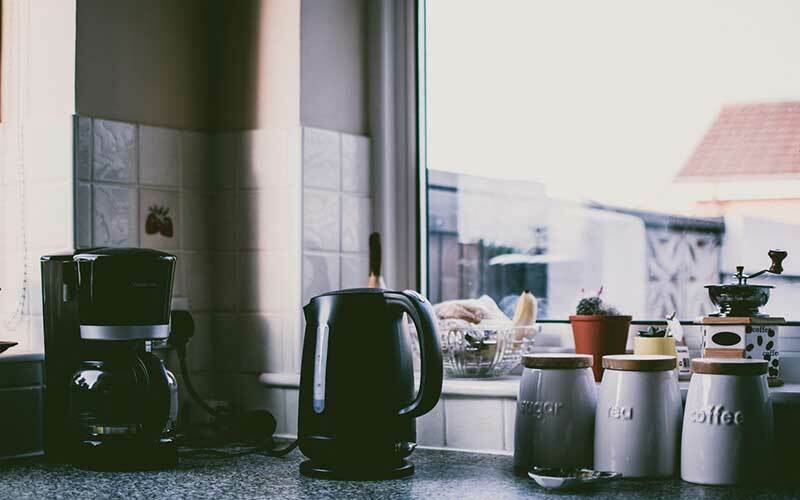 So, you’ll want to make sure your kettle boils your water faster than your stove or other appliances. 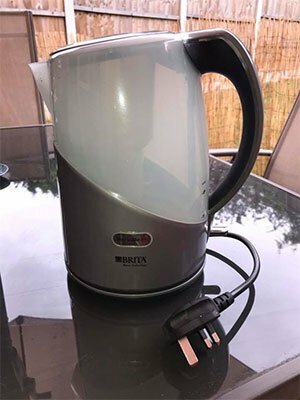 Typically, electric kettles can boil a full litre of water in 1-2 minutes. So if you’re waiting for more than 2 min for your cuppa, it’s generally not worthwhile. Lastly, keep in mind that filters will add a few seconds to your time. But more on that later. For now, just keep in mind that your kettle should get the job done much faster than your stove or microwave. 1 Litre is pretty standard for an electric kettle. After all, that’s enough for 4-5 cups of boiling water. Add a filter to the mix and you’re looking more at 2 cups. Anything less becomes laborious and time-consuming. These are critical if you live in a hard water area. In fact, filters are your most reliable form of keeping limescale out of your water. A good filter should be easily removable and easy to clean. Plus, be sure to check the price of your filter cartridge replacements. Some brands are extremely expensive and will run your wallet dry within a few months! Another great feature about filters is that they will supply you with clean drinking water. 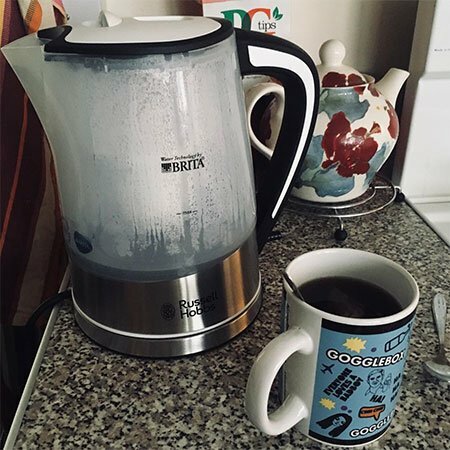 So even if you don’t plan to boil your water for some nice fragrant cuppa, you can still use your kettle as a source of healthy drinking water. Thus, filters definitely make your kettle a great 2-for-1 deal at that point. 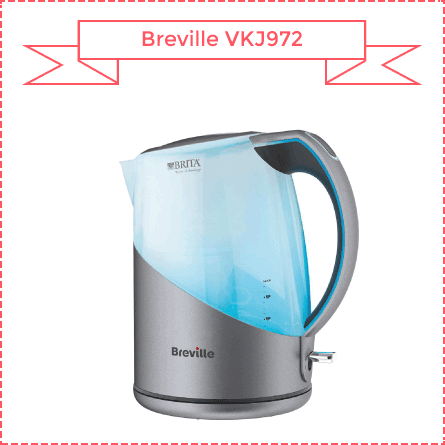 Most quality kettles you’ll find come equipped with a Brita Filter, which is one of the best brands on the market. These filters mix carbon and ion exchange resin, which almost instantly removes those common hard water deposits from your water. So, no more chlorine, metals, and organic impurities in your water. Better yet, you’ll even taste the difference upon your first sip. Note that Brita Filter cartridges are expensive. So be prepared, as you’ll need to change them on a monthly basis. First of all, these look cool. It’s like a mini rave of blue lights while your water boils! But most importantly, LED lights act as an indicator of when your water is boiling. So you won’t need to worry about pouring your water too soon or scalding your hands in any way. Plastic: This is the material that breaks and wears down the easiest. But then again, it’s also super affordable. So if you’re looking for a budget-friendly kettle, it’ll most often come in plastic. Also, keep in mind that plastic surfaces won’t heat as much as stainless steel or glass. So it’s less likely that you’ll scald yourself when touching it. And don’t worry too much about the cancer scares surrounding heated plastic. Overall, plastics linked to cancer are used in making hard containers or flexible objects—not tea kettles. Stainless steel: This material makes your kettle ultra-durable and super-easy to clean. Plus, it’ll add a sleek look to your kitchen counter. The downside here is that the stainless steel will limit your visibility when it comes to seeing how much water is in your kettle. Glass: In most cases, glass is mostly there for some added visual appeal. And when added as an accent to stainless steel, it adds a more polished and refined look to the kettle. But, as you know, glass can be fragile. So you’ll need to express extra caution when cleaning or moving it. Also, any rapid increases in heat can cause the kettle to break or shatter. Really, boiling water shouldn’t be a difficult task. In fact, it really shouldn’t take any longer than 2 minutes of your time. So you’ll want to ensure that your kettle is easy to use. First of all, check for a comfortable grip handle. Nothing too fancy here. Just make sure your hand fits comfortably under it. And if you’re left-handed, you can find ambidextrous handles easily. While you’re at it, check for a 360-degree swivel base to make gripping easier for left and right-handed users. Next up, a visible water gauge will make your life leagues easier. After all, don’t you want to know how much water sits in your kettle? no one likes a ¼ cups of tea! And while we’re on the topic of water amounts, check for a wide pouring spout. Seriously, you’d be surprised by how annoying a narrow spout is to use. Simply put, small spouts will add a minute or two to filling your kettle. Even worse, small spouts get messy if you don’t get the stream of water from your tap just right! Living in a hard water area can be annoying. But that doesn’t mean you should pay extra for your water! After all, we just took a look at three kettles that’ll solve your drinking water problems for an ultra-affordable price. And in the process, you’ll get some fantastic and clean-tasting coffee and tea! So read through our reviews a few extra times! And don’t delay picking up an electric kettle for your hard water area today!